The Compressor Spin Pit Facility (CSPF) is designed to investigate a range of aeromechanic phenomena for gas turbine engine hardware rotating at full engine speed. Installed in early 1999, the CSPF is intended to generate the data needed to validate emerging modeling and design tools for the development of aircraft gas turbine engines. Currently, the facility is applied to the study of blade-casing rub-in-systems of the type used on contemporary gas turbines to improve the tip clearance behavior for the engine's entire life span. CSPF incursion mechanism and rub-shoe. The CSPF consists of an in-ground containment tank that supports a highly rigid spindle rated at 20,000 rpm. 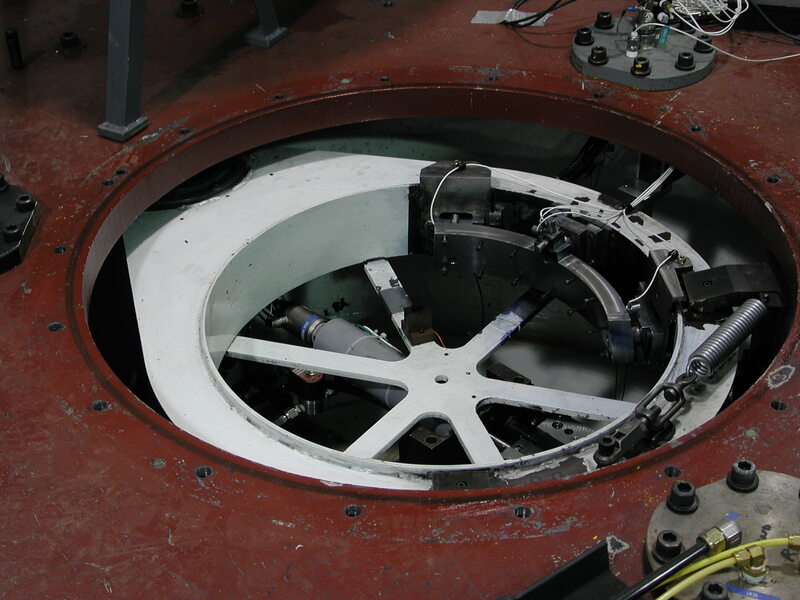 Engine rotors undergoing investigation are mounted on the spindle with an adapter and can carry a variety of sensors for the desired measurements. Transducer power and signals are transmitted to and from controlling equipment through a high speed slip-ring. Additional mechanisms required in the experiments are attached inside the containment tank. The CSPF is capable of accommodating medium to large compressor and turbine rotors (maximum diameter 34-in). In the ongoing compressor disk investigation, the facility is equipped with a metric fast-acting mechanism that has been developed to perform blade rubs at full engine speed. The facility is designed to allow insertion of a segment of engine casing into the path of the single or multiple bladed disk with predetermined blade incursion into the casing. The casing sector is mounted on a metric unit based on three piezoelectric load cells and attached to a support ring that swivels in the horizontal plane. The single throw by a fast acting gas piston attached to a cam follower is coupled to the support ring and brings the casing in and out of the path of the rotating blade for a few rubs over a time interval of about 20 milliseconds. The incursion of the rubs is prescribed by setting the initial position of the mechanism in increments of 0.2 thousandths of an inch. 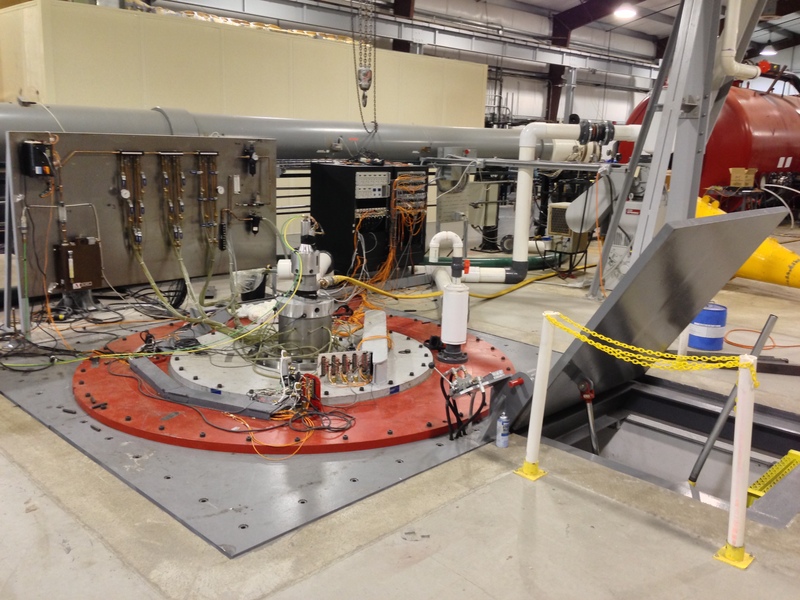 The newest experimental facility at the Gas Turbine Laboratory is the Large Spin Pit Facility (LSPF). Building on the intense interest in data from the Compressor Spin Pit (CSPF) and lessons learned about the experimental process, this new facility is large enough to accommodate scaled bladed rotors up to 60 inches in diameter. Like the CSPF, its primary purpose is to study the physics of blade tip-rubs and other aeromechanic events. Above ground spindle of LSPF. Compared to the CSPF, distinctive features of the LSPF are a progressive incursion mechanism that allows control of the incursion rate and depth instead of just depth and optical access windows for high-speed imaging of the rub event. In addition to continuing aeromechanics research, this facility can also be used for internal heat transfer experiments investigating the flow through large-scale blade cooling passages.